If the problem persists only with the hard drive attached, order a new Xbox 360 Hard Drive from our Xbox Online Service Centre (sign in with your Microsoft account). Unplug all accessories connected to the front or back of the console, including video cables, network cables and USB devices. 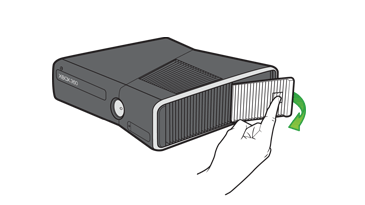 On the right-hand side of the console, locate the hard drive cover release close to the back of the console. 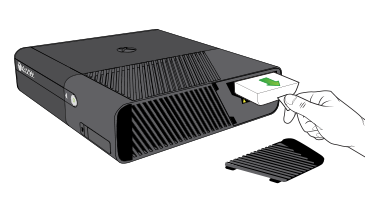 If the problem persists only with the hard drive attached, order a new Xbox 360 Hard Drive from our Xbox Online Service Centre (sign in with your Microsoft account). Console registration is required to replace a hard drive under warranty.